Before leaving town, Pam and I met up with Alex and Marcie again for some great pizza at the Moose’s Tooth restaurant in Anchorage. I was glad I could fulfill my offer to bring some fresh caught halibut back from the peninsula. We handed off several pounds of halibut fillets, said our goodbyes and headed north. There were just three stretches of the Alaskan Highway system we had not traveled on yet that were now our objective: one, the Parks Highway from Anchorage to Denali; two, the Tok Cutoff into Tok from the south; and three, the Taylor Highway in eastern Alaska that is part of the Klondike Loop into Canada. Traveling on the Parks Highway would also give us another opportunity to see the Denali mountain, which was hidden behind clouds on the four previous days we in the park area and could have seen it. 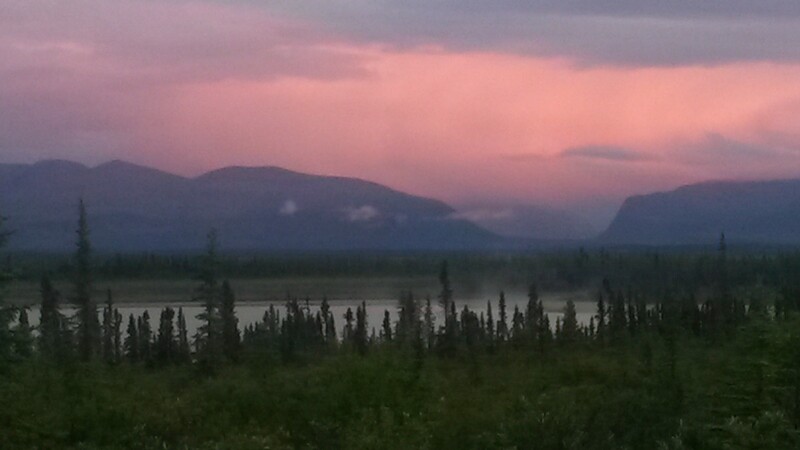 Intermittent rain as we drove north out of Anchorage did not fill us with confidence of a sighting so we stopped for the night at Byers Lake Campground, on the southern end of Denali Park. The lake there was another pretty Alaskan lake. We went for a hike to the boat launch and dock area. A few families were at the dock with at least six Labrador retrievers. One of the guys had a duck retrieving training toy that he was whipping into the lake so all of the dogs were very happy and very wet, including a couple of their kids too. Pam and I were adequately sniffed by all of the dogs as we approached, but luckily none decided to dry off next to us. 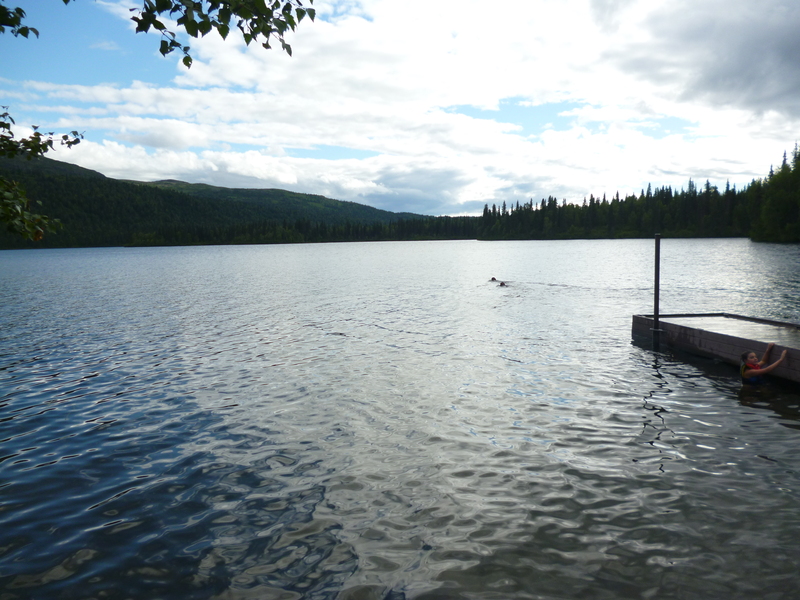 Here are two of the dogs swimming out into the lake after the toy. The next morning began with large patches of blue sky, which has become the weather trend for this time of year. It’s never bad weather all day, nor is it blue skies all day, and whatever it is now will be the opposite by the end of the day, and opposite again in the morning. Therefore, it’s always sunny wherever you are, you just need to wait for it long enough. As we drove north there were a couple of Denali Lookout points, but the few pesky clouds were still gathered around the peak at these lookouts. As we crossed over the last high altitude pass north we looked to the west and there it was. Even at 45 miles away the mountain dominates the horizon. It’s pretty impressive and dwarfs the several thousand foot mountains that are its foothills. 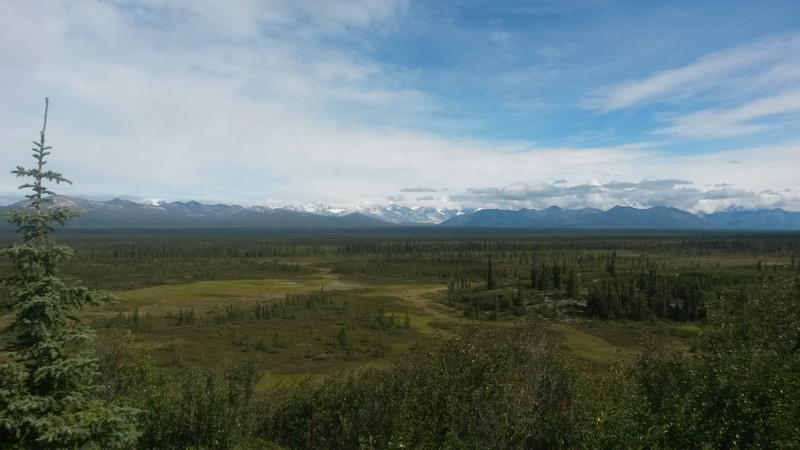 With that stretch of road complete, and the bonus of seeing Denali, we headed towards the other two stretches on the east side of Alaska across the Denali Highway for a second time. 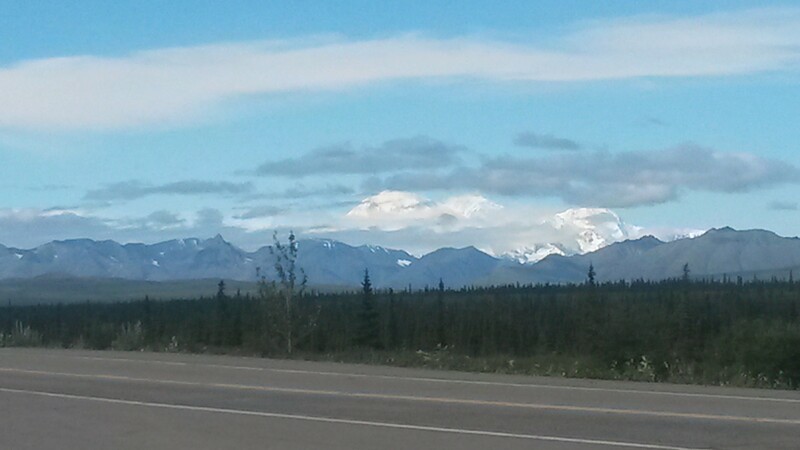 It was again a beautiful drive, where the recent weather had given the Alaskan Range mountain tops a dusting of snow. 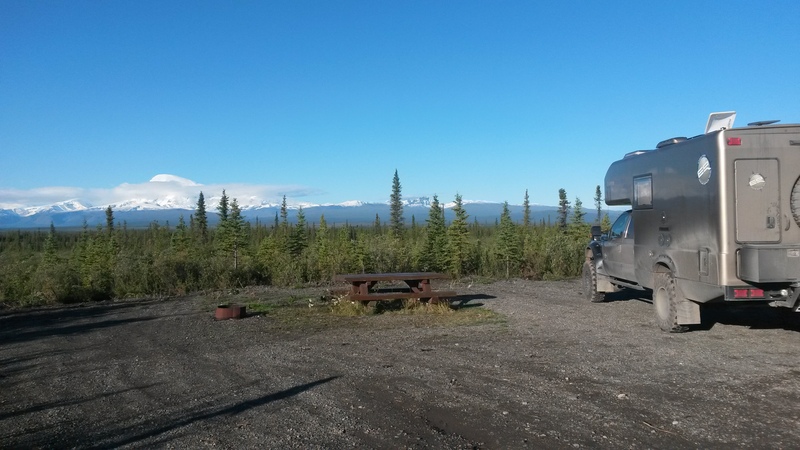 We originally thought to camp along the Denali Highway when we left Anchorage before pulling off at Byers Lake. It was a good thing we changed our minds because every pull-off along the highway was now occupied by a truck or ATV trailer. Caribou season for local subsistence hunters opened the day before and they were out in force. The caribou are starting to herd up for the winter and are on the move now, but we didn’t see any along this stretch of the drive. 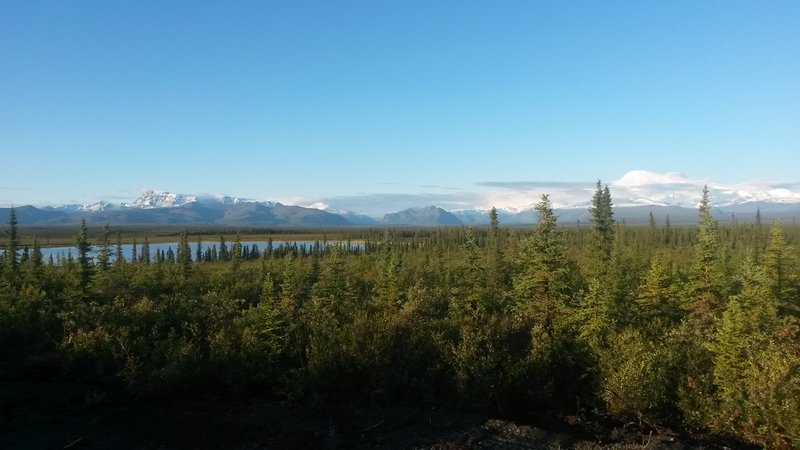 We hit the Tok Cutoff road heading north and realized that the northern entrance to the Wrangell-St Elais NP is off of this road – so we took it. We headed down Nebesna Road and camped at the Dead Dog Hill Wayside pull-off, a spot with a single picnic table and fire pit. We had a panoramic view of a beautiful black spruce boreal forest and our own glacier-made kettle lake with two trumpeter swans. The sunset was pretty spectacular as the weather moved through, but the morning view was even better when from behind the evening clouds Wrangell Mountain came into view on the right above the clouds. We had a nice evening fire and I cooked up bacon cheeseburgers on pretzel rolls for dinner. This spot is now a solid top ten spot. A Swiss photographer showed up in the morning snapping a lot of shots. He and a buddy drove the 20-some more miles down the pot-hole riddled road to the official park campground, but according to him, the view was not nearly as nice as what we had. He and his buddy (who was still snoozing at the campground) had started their Alaskan trip with the objective of backpacking through the tundra north of the Arctic Circle, but quickly realized that the very uneven tufted growth of the tundra surface is not a great place to hike with heavy packs. They have since been driving around car-camping, but seemed to hit every location in the rain (obviously moving too quickly to let the weather clear). Therefore, he was in heaven when he saw the view from our wayside pull-out. I told him how the scenery changed over time the previous night, from rain to partly cloudy, to a blanket of fog rolling through, but below the treetops after the sun went down. He was so happy to finally get some good pictures with his camera and lenses that I’ll be surprised if he didn’t come back after leaving the campground and stay at the pull-out after we left. We had breakfast, broke camp and heading north arrived at Tok, one of the first towns we came to after crossing the Canadian border several weeks ago. 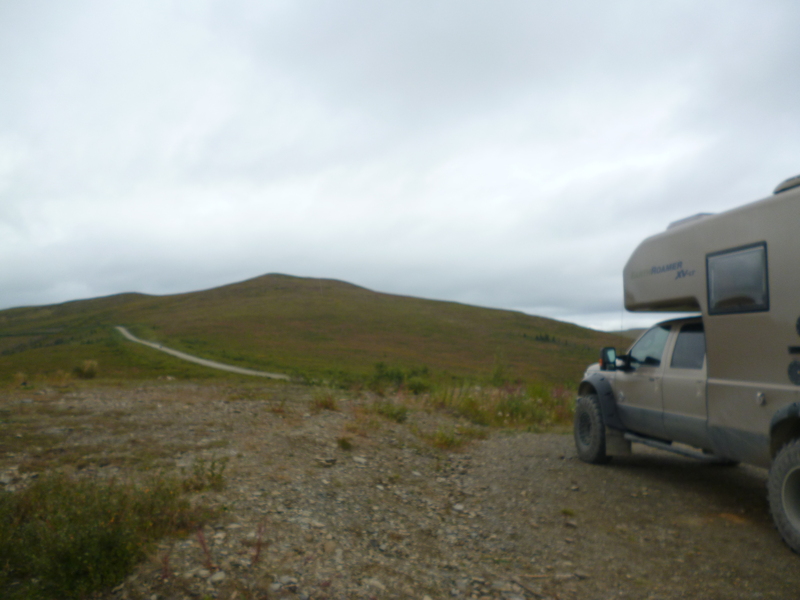 Crossing our old path in Tok completed a several thousand mile loop of Alaska. We’re currently over 8,000 road miles for the trip so far (not counting the ferry miles from Bellingham to Haines). We’ll see if we break our last year’s trip mileage of 12,600 miles. 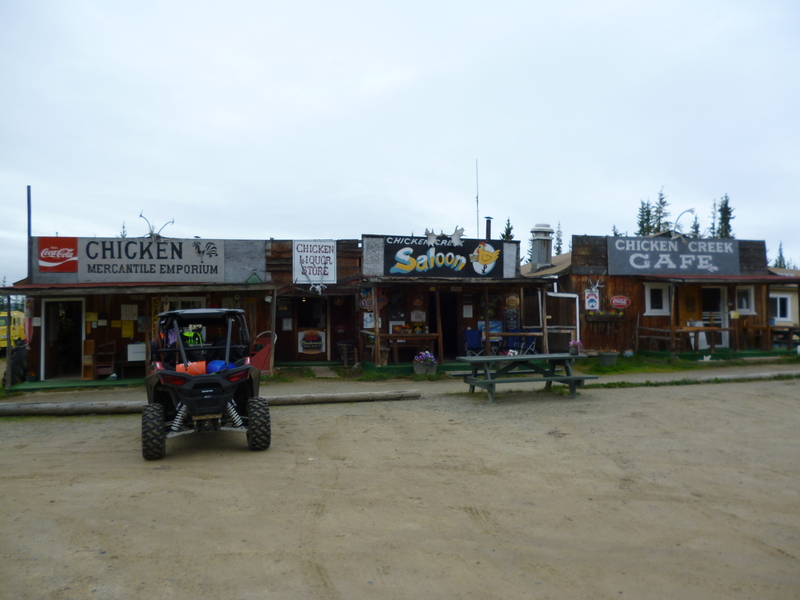 We then headed north to Chicken along the Taylor Highway, the last stretch of untraveled Alaskan highway. Chicken is a very small gold mining town. 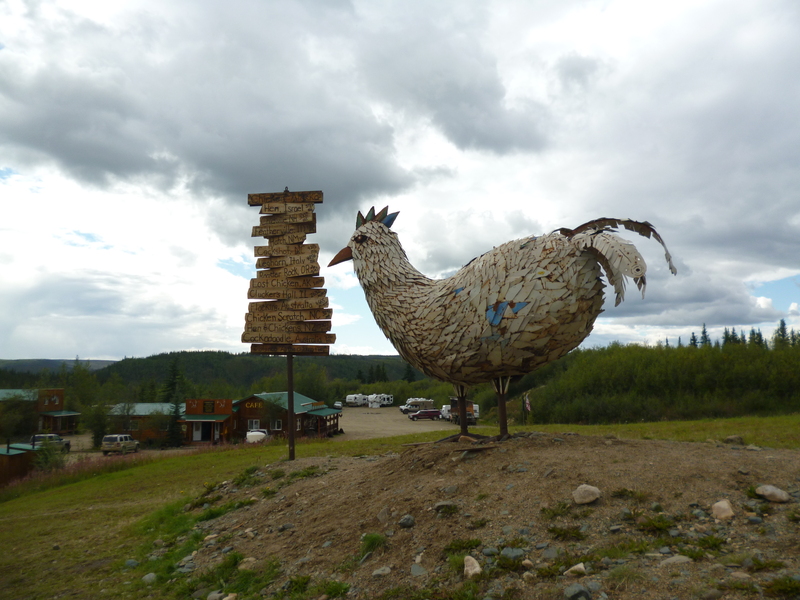 Apparently they wanted to name it Ptarmigan, the wild Alaskan bird that looks like a chicken, but none of the original miners knew how to spell it, so it became Chicken. The road there was full of great vistas and the ground cover is starting to show signs of fall colors up here. It’s dropping into the 30s at night so I’m sure it will be cool weather from here on out on this trip. 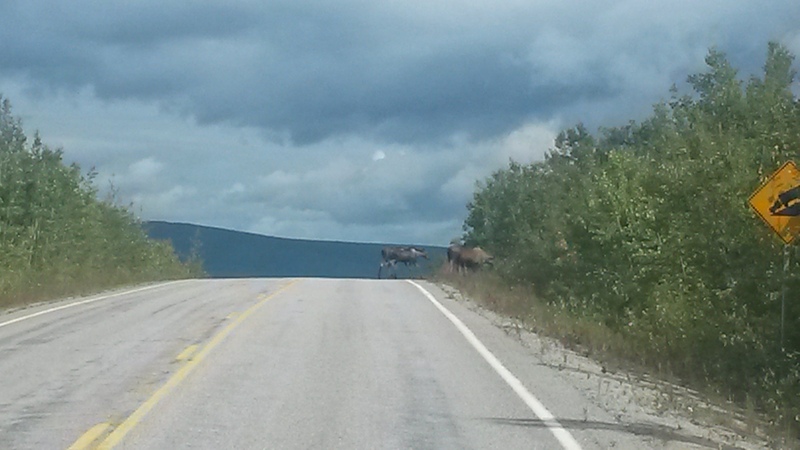 We came across a moose and two babies walking across the road on our way to Chicken. The babies are noticeable larger than the ones we saw just a month ago. Chicken has just a few buildings in town. We spent the night at the Gold Panner’s RV Park, which like most RV parks is just a parking lot. The town has everything named with a chicken related theme, even including the outhouses, the chicken poop. The 15-foot chicken sculpture has the distance (as the chicken flies) to every city in the world with a chicken related name, like Hatch, New Mexico. They even have a summer music festival in June called Chickenstock with a pretty unique stage. 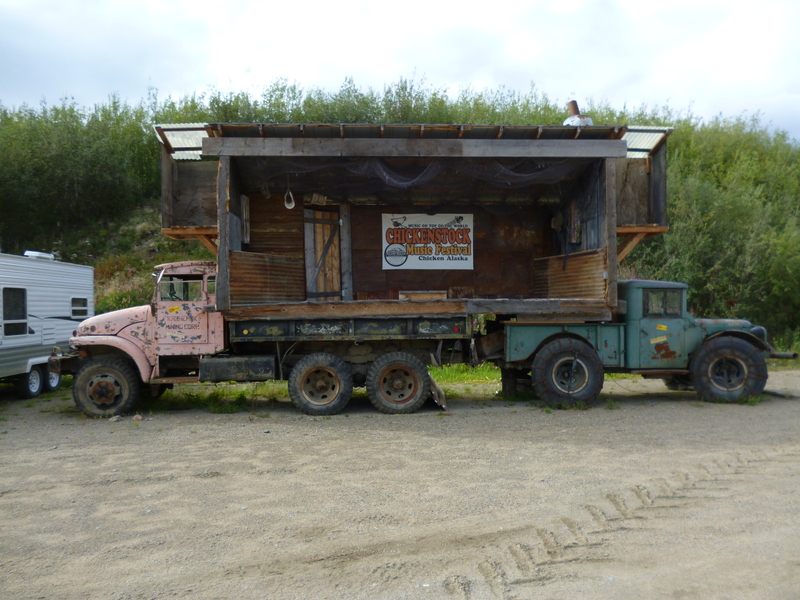 We mentioned to a local shop owner that we had traveled on every highway while in Alaska, feeling proud of our accomplishment, only to be slammed with her reply – well there are only five highways in Alaska. What a buzz kill. We headed out of Chicken to Eagle along the Top of the World Highway. It has all kinds of driving warnings due to the condition of the road in the Milepost book (which is part of the reason we took it). Not far outside of Chicken there was a large RV pulling a car that got too far over for an oncoming vehicle and slid off the road, tipped over the bank, and was resting on its side wedged down in the trees. Luckily no one was hurt, but you begin to appreciate how remote you are when you think about the timeline for this vehicle to get pulled out and to the nearest garage about 100 miles away. The road splits further outside of Chicken and we took the path north to Eagle. The other path goes to the Canadian border and Dawson City, Yukon. The Eagle road is another beautiful road to drive with even more warnings to keep traffic very low. 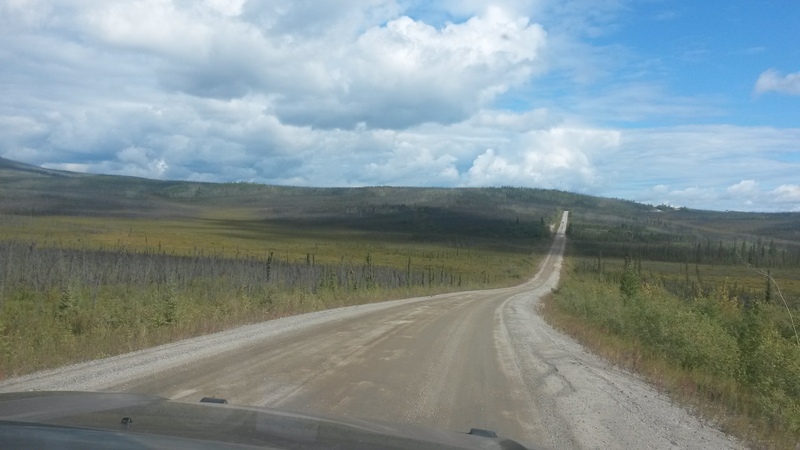 It actually was a nice dirt road due to the low traffic, but it was just single lane wide at some spots, which is common for remote roads anywhere. We stopped for lunch on a tundra plateau with a great 360 degree view. 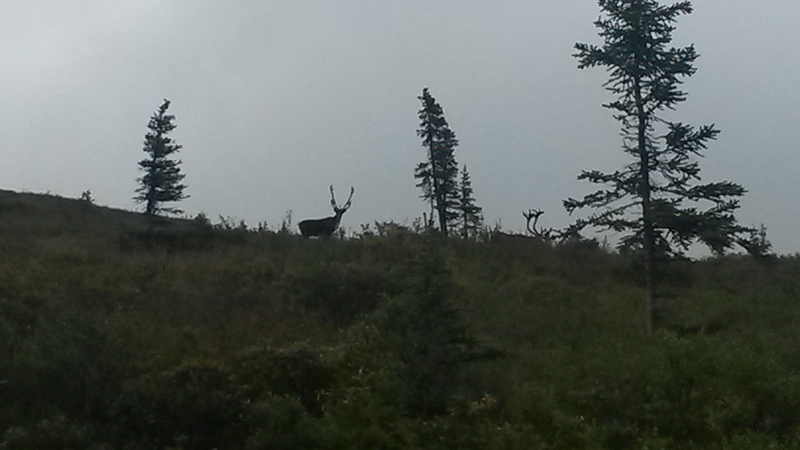 Pam spotted three caribou in the area, where two of the racks were visible in this shot. One of the bulls stopped to check us out as we watched them graze through. Eagle is a relative metropolis with a population of 87 compared to Chicken. Surprisingly, the history of this town on the mighty Yukon River was very impressive, nearly rivaling Sitka. Because of its location on the Yukon River and proximity to the Klondike gold area it was the first incorporated city in the Alaskan interior in 1897. A military fort was established here, Fort Egbert, to provide law and order to the area , and to build the WAMCATS – Washington-Alaska Military Cable and Telegraph System at the turn of the century. Communication between these two points went from taking an entire year to just a few days. A young Army Lieutenant Billy Mitchell stationed here got the cable system connecting Eagle to Vadez completed. He later was the visionary that pushed for the Army Air Corps in WWI that later became the Air Force of today. 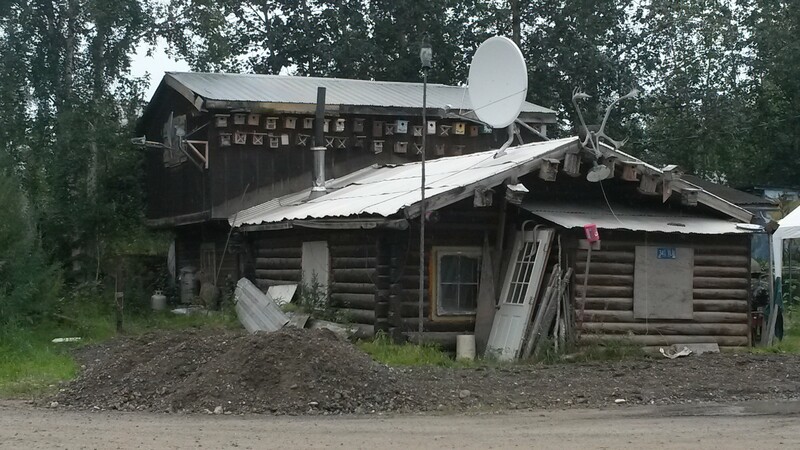 It was even the judicial center for all of central Alaska, and it wasn’t clear how everything then moved to Fairbanks from Eagle to leave this hamlet a shadow of its old glory. The town has some interesting houses. This person is obviously a bird lover. 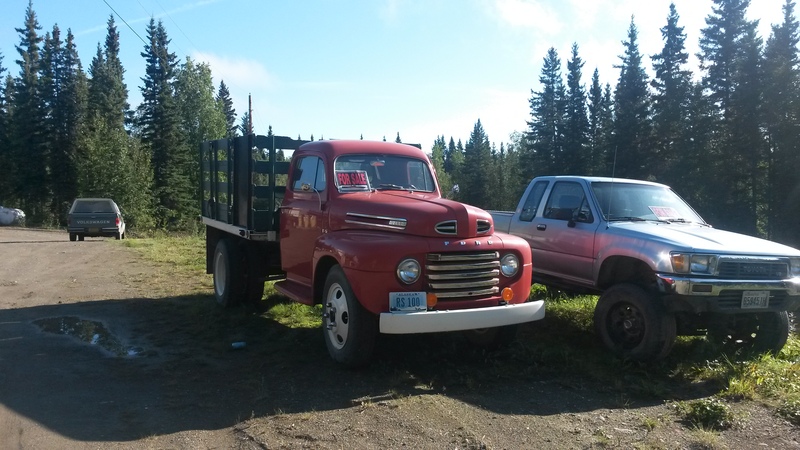 They also have some great vehicles for sale there. Big Red did a road trip to Eagle? We camped at the Eagle BLM campground for the night listening to the local radio station FM 97.7, which plays the greatest collection of eclectic music from church organs, to Sinatra, to folk, to blues and even barbershop quartets with no commercials. It was great listening to it and we were sad as we drove out of town and the station faded away. So ends our Alaska trek. 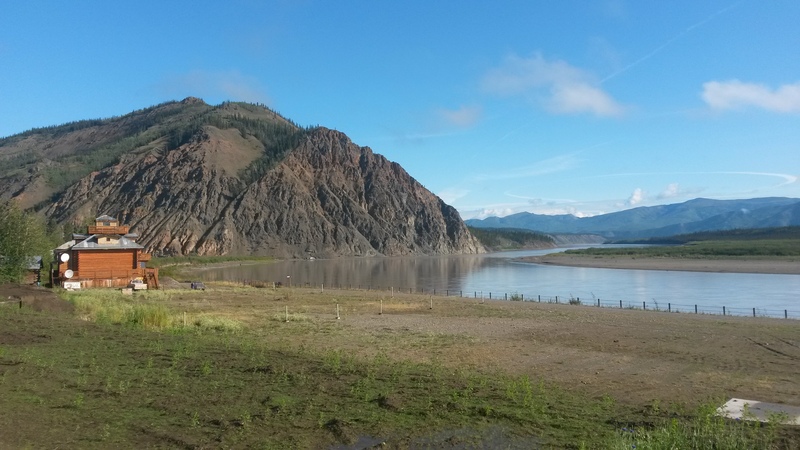 We crossed into Canada and began our next leg of this trip down through the Yukon and the Canadian Rockies. We’ll definitely be back. As one guy we ran into recently stated, “I came up here just to see Alaska too, that was 30 years ago”.